Author contributions: Morita S designed and performed the research and wrote the paper; Fukagawa T and Katai H supervised the report; Fujiwara H provided clinical advice; Katai H designed the research and contributed to the analysis. Institutional review board statement: We have not included a statement of IRB review, since IRB approval is not required for questionnaire research that does not provide personal information. Informed consent statement: Patients were not required to give informed consent prior to participation in the study because the analysis used anonymous clinical data that were obtained after each patient had agreed to receive treatment and had provided written consent. Conflict-of-interest statement: We have no financial relationships to disclose. To verify the current status of super-extended lymph node dissection for advanced gastric cancer according to a questionnaire survey. One-hundred and five institutions responded to the questionnaire. The survey included the following items: Number of experiences, whether performed prophylactically and/or therapeutically, whether preoperative chemotherapy was provided, number of preoperative chemotherapy rounds, and therapeutic options after chemotherapy. Eighty-seven of the 105 institutions (83%) had performed D3 gastrectomy in the past or continued to perform D3 gastrectomy at present. However, D3 gastrectomy was rarely performed prophylactically in clinical practice. Seventy-eight institutions (74%) indicated that preoperative chemotherapy with curative intent was required for patients suspected of having para-aortic node (PAN) metastases. After chemotherapy, a D3 gastrectomy was scheduled for patients with a complete or partial response, stable disease, and progressive disease at 36 (46%), 28 (36%), and 13 (17%) of the institutions, respectively. For patients with apparent PAN metastasis, a D3 gastrectomy is typically planned if a few courses of preoperative chemotherapy yield at least a stable disease condition. Core tip: In this paper, we discussed the current status of super-extended lymph node dissection (LND) for advanced gastric cancer based on the results of a questionnaire survey. A recent study has indicated that prophylactic super-extensive lymphadenectomy does not improve the survival rate in patients with curable gastric cancer. In another study, surgery with para-aortic dissection was effective with the addition of neoadjuvant chemotherapy. Although super-extended LND seems to be rarely accepted worldwide, the rigorous and careful selection of patients can provide long-term survival after systemic LND. Therefore, we present the current status of super-extended LND in Japan. Gastrectomy with D2 lymph node dissection (LND) has been the standard operation for advanced gastric cancer (AGC)[1,2]. Although the efficacy of LND has been proven, patients with extensive nodal metastasis have a poor prognosis, even after R0 resection. Lymphatic flow from the stomach streams into the perigastric nodes and then passes to the nodes around the celiac axis and its main branches. Following its influx into the para-aortic nodes (PANs), it finally joins the systemic circulation via the thoracic duct. Thus, the PANs have been regarded as the final nodal station requiring dissection to remove the threat of systemic metastases originating from the lymphatic system. Therefore, Japanese surgeons pursued a path of lymphadenectomy expansion with curative intent in the 1970s and 1980s. Although a super-extended dissection can be safely performed with acceptable operative risks, the long-term outcomes of patients with PAN metastasis have been less than spectacular, with reported 5-year survival rates of less than 30% and an incidence of PAN involvement from AGC of 10%-30%[4-8]. To investigate whether para-aortic nodal dissection (PAND) for gastric cancer has a survival benefit in a large prospective study, the Japan Clinical Oncology Group (JCOG) conducted a multi-institutional, randomized, controlled trial of D2 vs D2 plus PAND for patients with curable gastric cancer. This trial obtained evidence that the recommendation for extended D2 lymphadenectomy plus PAND should be withdrawn for the treatment of T2b, T3, or T4 curable gastric cancers. Critics have pointed out that PAN involvement indicates a systemic level of metastasis that is already outside the reach of surgical management, and dissecting these lymph nodes is not necessarily correlated with a better prognosis, at least in a preventative manner. In response to this result, the new Japanese Classification of Gastric Carcinoma (JCGC) excluded PAN from the regional lymph nodes of the stomach. Positive No.16 lymph nodes are treated as distant metastases, resulting in a Stage IV classification. Therefore, Japanese surgeons have revised their treatment strategy by focusing on highly effective treatments, such as a multimodal approach that includes chemotherapy to reduce recurrences after radical surgery. At present, surgical resection is the only way to remove tumors completely. We present an overview of the current status of PAND in Japan, having gathered information through a questionnaire survey. At the 2012 annual meeting of the Japanese Society for Gastro-surgical Pathophysiology, 13 data items, including PAND for patients with primary AGC, were collected retrospectively using a questionnaire survey. In this study, D3 gastrectomy was defined as D2 plus PAND, and the further dissection of other group 3 nodes described in the 13th JCGC was not necessarily required. The PANs, which are defined as the third tier, correspond to the No.16-a2 areas (nodes between the level of the celiac axis and the left renal vein) and the No.16-b1 areas (nodes between the left renal vein and the inferior mesenteric artery), based on the JCGC. The questionnaire contained questions regarding experience level, indications for prophylactic or therapeutic use, and data pertaining to preoperative chemotherapy (Table 1). Unexamined cases and patients with missing data were excluded when calculating the incidence. Table 1 List of questions regarding para-aortic nodal dissection. 1. Do you have any experience performing D2 plus PAND (so-called D3 surgery)? Please indicate the number of patients who have received D3 surgery at your institution and go to question 2. 2. When performing a distal gastrectomy, do you dissect the left upper lateral nodes (“No.16-a2-lat”)? 3. The following questions concern prophylactic PAND. 3-1. Do you dissect PAN prophylactically, even if there is no obvious metastasis in the same area? 3-2. Do you perform PAN sampling in the absence of an enlarged PAN? 3-3. Do you dissect PAN additionally in cases that test positive after an intraoperative rapid diagnosis? 4. The following questions concern therapeutic PAND. 4-1. Which treatment option do you select if there is obvious metastasis in the PAN area? 4-2. Which chemotherapy regimen do you use? 4-3. How many courses of preoperative chemotherapy do you use? 4-4. Do you administer additional chemotherapy if a complete or partial response is obtained after the preoperative chemotherapy? 4-5. Please select the extent of the lymph node dissection that you use for patients with a complete or partial response after preoperative chemotherapy. 4-6. Please select the extent of lymph node dissection that you use for patients with stable disease after preoperative chemotherapy. 4-7. Please select the extent of lymph node dissection that you use for patients with progressive disease after preoperative chemotherapy if there is no evidence of distant metastasis, except for PAN swelling, is present. 4-8. Please select the extent of lymph node dissection that you use for patients who have not received preoperative chemotherapy. The questionnaire was prepared and sent to 254 institutions. One hundred and five institutions (41.3%) responded to the survey. The geographical and functional distributions of the responding 105 hospitals are shown in Figure 1A. Fifty-two were academic medical centers and seventeen were cancer centers. The other 36 institutions were general hospitals. Figure 1 Geographical distribution, experiences and hospital volumes in the 105 responding hospitals. 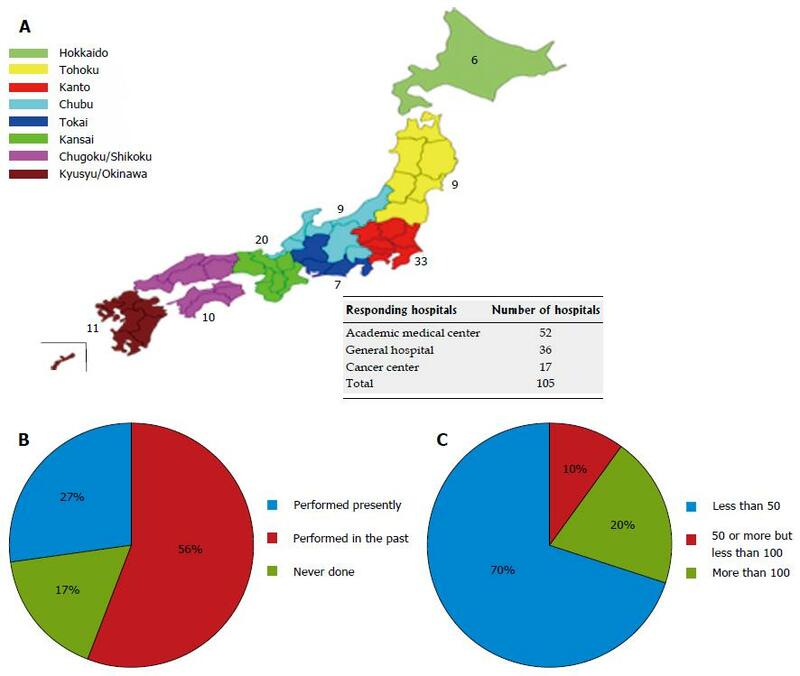 A: Geographical and functional distributions of the responding hospitals according to Japan’s regions; B: Results for the question regarding experience performing PAND; C: Results for the question regarding the number of experiences performing PAND. PAND: Para-aortic nodal dissection. Do you have any experience performing PAND? Eighty-seven (83%) of all the responding institutions had experience performing PAND, and 28 institutions (17%) were still performing this procedure (Figure 1B). Fourteen institutions had each performed more than 100 procedures. Seven institutions had performed 50 or more procedures but less than 100 procedures. Forty-nine institutions did not have much experience, having performed less than 50 procedures (Figure 1C). Seventeen institutions did not provide a specific number of procedures on the questionnaire form. When performing a distal gastrectomy, do you dissect the left upper lateral nodes (“No.16-a2-lat”)? For a distal gastrectomy, the dissection of the left upper lateral nodes (“No.16-a2-lat”) has been regarded as optional because of the low incidence of metastasis. Twenty-six (30%) of the 86 respondents reported dissecting the a2 lat nodes even if the resected part was distal to these nodes; 40 institutions (47%) reported that they sometimes dissected these nodes, and 20 institutions (23%) reported that they never dissected these nodes. For cases with no preoperative evidence of metastasis in the PAN, almost all the institutions never performed a prophylactic D3 dissection. Six (6%) of the 105 respondents performed prophylactic D3 dissections for staging purposes or in the case of nodal swelling in the supra-pancreatic area (Figure 2A). Only 21 institutions (20%) performed sampling at this site. Of the 21 institutions, 8 (38%) performed an additional dissection of the para-aortic area, if the examination of frozen samples was positive. Figure 2 The answers to the questions related to prophylactical and therapeutical para-aortic nodal dissection. A: Results for the question regarding whether para-aortic nodal dissection is performed prophylactically; B: Results for the question regarding treatment options for patients with obvious metastasis in the para-aortic nodal area. For cases with apparent preoperative metastasis in the PAN, 78 (74%) of the 105 respondents reported performing preoperative chemotherapy, and 7 institutions (7%) reported performing a D3 dissection without other therapies. The remaining institutions performed systemic chemotherapy in such cases (Figure 2B). The most common preoperative chemotherapy regimen was a combination of S1 and cisplatin, which was selected by 57 (73%) of the 78 respondents. A triple-drug combination of S1, cisplatin and docetaxel was the second most common combination, selected by 20 institutions (26%). Two cycles of preoperative chemotherapy were selected by 62 institutions (79%), and three cycles were selected by 7 institutions (9%). If a complete or partial response was achieved after chemotherapy, 35 institutions (45%) provided additional chemotherapy for up to six cycles. For cases with a PR or CR, the performance of an additional D3 dissection was selected by 36 (47%) of the 77 respondents, while a D2 dissection plus sampling was selected by 34 institutions (44%). 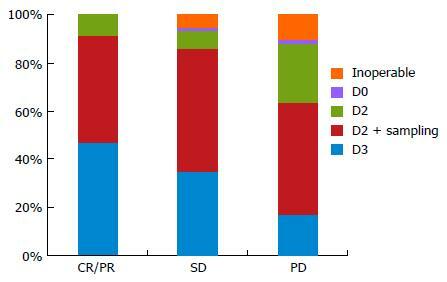 Seven institutions (9%) limited the extent of LND to a D2 dissection. For SD cases, the performance of an additional D3 dissection was selected by 27 institutions (35%), while a D2 dissection plus sampling was selected by 39 institutions (51%). Four institutions (5%) selected non-surgical treatment. For PD cases, 13 institutions (17%) still perform D3 dissections, although 36 institutions (47%) select a D2 dissection plus sampling and 19 institutions (25%) select a D2 dissection. Eight institutions (10%) have abandoned surgical treatment (Figure 3). Operations without preoperative chemotherapy were only performed at 7 institutions (7%) overall. Figure 3 Results for the question regarding treatment options after preoperative chemotherapy in patients with obvious para-aortic nodal metastasis. The 2008 annual report of the JGCA showed that D3 dissection was only performed in 7.2% of all surgically treated patients. In our data set, about 26% of the institutions that responded are still performing D3 gastrectomy. Overall, the number has been declining. The main reasons for this decrease are generally attributed to the following three aspects. First, the survival benefit for patients treated with a super-extensive LND has reached a plateau with the technical evolution and systemization of the surgical procedure. Basically, Japanese surgeons have adhered to the traditional concept of a lymphadenectomy, which offers the best chance for the removal of involved lymph nodes and the treatment of AGC. However, metastasis to the para-aortic lymph nodes is correlated with a significantly poor prognosis, even after the complete surgical removal of these lymph nodes. Several reports have shown that the probability of PAN involvement is 30% at most. Several theories regarding the optimal level for extensive LND exist, and a uniform strategy has not yet been formulated. The second reason is that only patients with PAN involvement and neither peritoneal seeding nor liver metastasis are candidates for this treatment. With advances in mass-screening and imaging equipment, early gastric cancer now accounts for nearly 50% of all gastric cancers in Japan. Moreover, obtaining multiple slices on computed tomography and/or diagnostic laparoscopy has further reduced the number of patients who meet the selection conditions[12,13]. Thus, only a very few patients are likely to be candidates for this procedure, and such patients are rarely encountered in clinical practice. Thirdly, a large randomized clinical trial had a considerable influence on the present results. A report by the JCOG showed that there was no survival benefit for a prophylactic D2 lymphadenectomy plus PAND (70.3%), compared with a D2 dissection alone (69.2%), in patients with AGCs. Our data shows that prophylactic dissection is not popular in Japan. The results of the above-mentioned clinical trial have contributed to the recent reduction in procedures. Some institutions perform PAND prophylactically, although they are few in number. However, the purpose of such procedures is only for staging, and not for curative intent. About two thirds of institutions (62%) do not perform complete PAND even if the frozen examination of PAN is positive. Similarly, a few institutions (7%) plan to dissect these nodes during their first attempt in cases with apparent PAN swelling preoperatively. Regardless of surgical treatment, the number of institutions performing chemotherapy as the initial treatment has been increasing. This trend suggests that PAN involvement is regarded as being almost systemic, and the dissection of these lymph nodes is not necessarily related to a better prognosis, at least in a preventative manner. This situation emphasizes the importance of multidisciplinary therapies[14-16]. Several selected phase I and II trials of preoperative chemotherapy in patients with resectable gastric cancer have been performed since the 1990s[17-27]. The current practice for the treatment of patients with gastric cancer in Europe is now surgery with perioperative chemotherapy, after promising results were obtained in two major randomized control trials[15,28]. In Japan, two selected phase II trials of neoadjuvant chemotherapy followed by a D2 gastrectomy with PAND for resectable gastric cancers have been reported[27,29]. Although one trial was terminated because of treatment-related deaths, the other showed both the feasibility and the effectiveness of S-1 plus cisplatin followed by a D2 gastrectomy with PAND. In our data, around three-fourths of the institutions responded that they used the SP regimen for preoperative therapy. About one-fourth added one more agent, docetaxel, to the SP regimen. A neoadjuvant setting for tumor down-staging to improve resectability is considered to be required for the treatment of apparent PAN involvement, although some theoretical disadvantages do exist, such as tumor progression, oncological emergency, and a high perioperative morbidity. Further consideration will be needed to select the most effective regimen. Finally, the JCOG9501 study also reported a paradoxical interaction in that the survival rates were better for those patients assigned to D2 plus PAND than for those assigned to D2 alone among cases with pathologically negative nodes. This result may indicate the effectiveness of an extended lymphadenectomy in cases that have responded well to preoperative chemotherapy. Our study showed a pronounced propensity for patients with a good clinical response (at least more than stable disease after chemotherapy) to have undergone a D3 dissection. The determination of the optimal extent of LND (D2 or D3) in cases with a complete response after chemotherapy is still a matter of debate. On the other hand, a considerable number of SD or PD cases had undergone D3 including PAND. Kurokawa et al reported that the histological response rate seems to be a better surrogate endpoint for overall survival than radiologic response rate in studies of neoadjuvant therapy for gastric cancer. At the least, diagnostic laparoscopy should be a recommended preoperative examination for staging. Regarding the poor radiologic response to chemotherapy, careful handling is required after excluding apparent PD cases. To settle this important matter, further prospective validation is needed. The main limitation of this study was that the intended group was confined almost exclusively to patients with PAN involvement. In addition, this highly targeted group needed to meet stringent requirements consisting of the absence of peritoneal seeding and liver metastasis. Therefore, it should be noted that the response rate was comparatively low, given that mainly specialized institutions were included, and that biases in the data were unavoidable because of problems such as the limited number of patients from small and medium-sized hospitals. In conclusion, preoperative chemotherapy with curative intent is almost essential for patients with PAN involvement. However, this does not deny that super-extended LND may play a certain role in the course of radical therapy. This procedure should be confined exclusively to specialized institutions, since eligibility is limited and a high surgical proficiency is required. Super-extended lymph node dissection (LND), including the para-aortic area, is a controversial issue in the treatment of patients with advanced gastric cancer (AGC). The Japanese Society for the Study of Postoperative Morbidity after Gastrectomy conducted a nationwide questionnaire survey to clarify the current status of para-aortic LND for AGC. The long-term outcomes of patients with para-aortic node (PAN) metastasis have been less than spectacular. Positive No.16 lymph nodes are treated as distant metastases. The results of this study contribute to clarifying the current status of super-extended LND in Japan. Platinum doublet chemotherapy, S1 plus CDDP, is widely used as a neoadjuvant chemotherapy for AGC with PAN metastasis. The study showed a pronounced propensity for patients with a good clinical response to have undergone a D3 dissection. This large survey suggested that D3 dissections are not performed for prophylactic purposes. For patients with apparent PAN metastasis, a D3 gastrectomy is usually planned if a few courses of preoperative chemotherapy yield at least a stable disease condition. D3 dissection: Super-extended LND including perigastric, supra-pancreatic and para-aortic areas for AGC with a risk of extensive nodal involvement. This manuscript deals with questionnaire survey on super-extended lymph-node dissection in patients with AGC. The conclusion of this manuscript seems to agree with the general consensus of current Japanese surgical oncologists, and could be acceptable for publication.